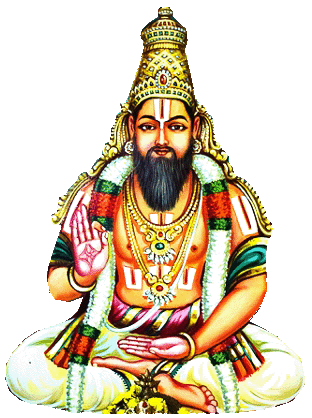 Koorathazhwan கூரத்தாழ்வான் was born as Kuresan in a small hamlet 'Kooram' near Kancheepuram, in the year of 1009 A.D (Sowmya year, Thai month, Hastham star), in a affluent family. He, belonged to the clan of 'Haritha', were popular landlords during those days. 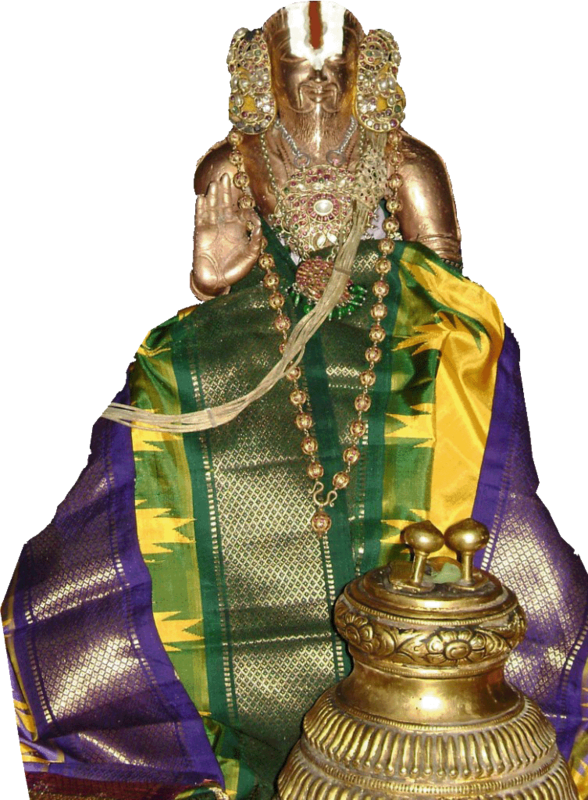 Koorathazhwan was married at a young age to Andalamma, a devoted and pious lady. Both of them led a happy and peaceful life. 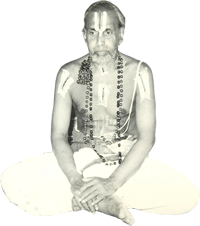 They were deeply devoted to Lord Varadaraja Perumal. The pious couple were very famous in the holy town of Kanchi, for their unstinting philanthropy and kindness azhwan came to a temporary end. Later Koorathazhwan continued his earlier philanthropic works. Meaning: I salute the great mahaan Srivathsa Chinha Misra (Swamy Koorathazhwan) whose Sri Sookthis became the thirumangalyam of the mother Veda (The 4 Vedas also named as Thrayee as mentioned in the above thanian). Kuresan was heavily influenced by the teachings of Swami Ramanuja, who was staying in Kanchipuram at that time. It was the time when Swami Ramanuja's teachings were growing popular and His fame was slowly spreading. 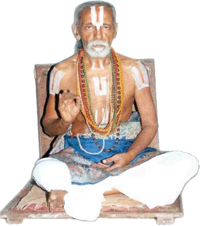 Kuresan quickly approached Swami Ramanuja and became his disciple. A bond was established between them and under the effective guidance of Swami Ramanuja, Kuresan was initiated into rigorous study of Vedic scriptures and other holy works. 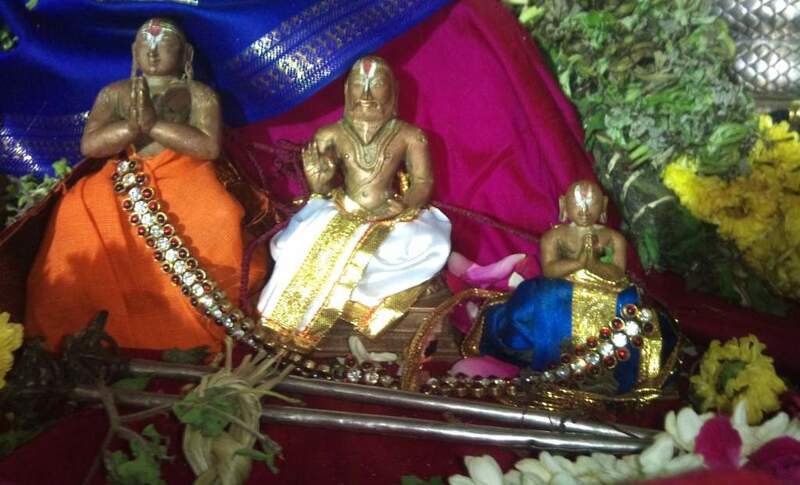 Meanwhile, due to other plans of the Lord, Swami Ramanuja moved to Srirangam and the frinedship between Swami Ramanuja and Koorathazhwan came to a temporary end. Once it happened that Lord Varadaraja Perumal and his Consort Perundevi Piraati heard a heavy sound of a door being closed. The actual reason was that, Kuresan had closed the brass doors of his home, after completing his daily routine of feeding the poor. By the order of the Lord, who appeared in the dream, the chief priest arrived at the door step of Kuresan to bring him to the Lord. On hearing this news, rather than feeling happy, Kuresan was extremely saddened, as he thought that it was a sin on his part to disturb the Lord and his Consort at the night time, by 'renouncing' his charity activities. This incident created a turmoil in the mind of Kuresan, which was a turning point in his life. He and his wife moved to Srirangam, where Ramanuja was staying. On reaching Srirangam, the couple were given a warm welcome and Ramanuja was very happy to have his old friend again. Kuresan became a disciple of Ramanuja and assisted him in all his works such as spiritual study, management of the temple, philosophical compositions and many others. Soon Koorathazhwan became the hand and eye of Swami Ramanuja. Later during Chola Kings reign, there was arguments going on between who is superior of all, Shiva or Vishnu. The King sent his courtiers to Ramanuja's mutt to bring him to his court. Knowing about the danger that Ramanuja might undergo, Azhwan decided to go to the kings courtiers in disguise wearing Kashayam cloth and carried tridandam. Along with Azhwan, Peria Nambi also went to the court. The King instructed a written declaration which should read "Nothing higher than Shiva exists", and commanded them both to affix their signatures to it without protest. Kuresan refused. He launched into a long and magnificent recital of authoritative texts and sources from the Vedas, Upanishads, Smritis and Puranas that proved that Narayana was the Supreme Principle and none was higher than Vishnu and hence he was the only object fit for worship and contemplation. The Chola King was incensed. Thrusting a writing-quill into Kuresan's hands he commanded Kuresan again to forthwith sign the declaration swearing allegiance to Shiva. "If you refuse we shall have your eyes pulled out here and now!". On hearing this Kuresan flew into a greater rage. He grabbed the quill from the King's hands and said, "But let me save you from the trouble, you tyrant, I shall pluck out my eyes by my own hand! These eyes that have set sights on a sinner such as thee have no further use for me!". So saying Kuresan plunged the sharp writing-quill into his own eyes,and extracting ball from socket threw his eyes on the floor at the King's feet! The sudden and violent act of martyrdom of Kuresan struck terror into the hearts of all assembled there! The cruel King remained unfazed! He turned next to Mahapurna and commanded him to sign the declaration of apostasy. The elderly Sire too flatly refused, upon which the vengeful King ordered his courtiers to overpower Mahapurna and gouge out the old 'AchAryA's' eyes without further ado! He leaves srIrangam to go to thirumAlirunchOlai (after emperumAnAr leaves to thirunArAyaNapuram/mElkOte) where he stays for 12 years. 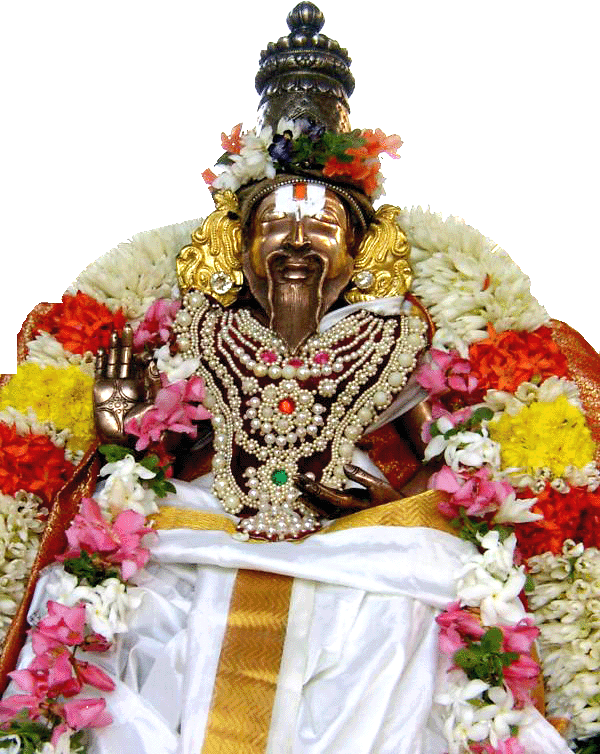 He sings sundhara bAhu sthavam (one of pancha sthavam sung by him) to kaLLazhagar (thirumAlirunchOlai emperumAn). He returns back to srIrangam after hearing about emperumAnAr's return to Sri Rangam. 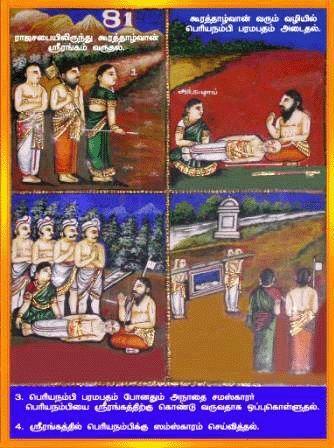 Under the instructions of emperumAnAr, he sings varadharAja sthavam to dhEva perumAL, and in the end asks for mOksham to all his sambhandhis – especially nAlurAn (who was one of the main causes for him losing his eyes). 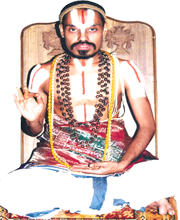 In total he sings pancha sthavams – srI vaikuntha sthavam, athimAnusha sthavam, sundhara bAhu sthavam, varadaraja sthavam and srI sthavam – all of them contains the juice of vedantha meanings. 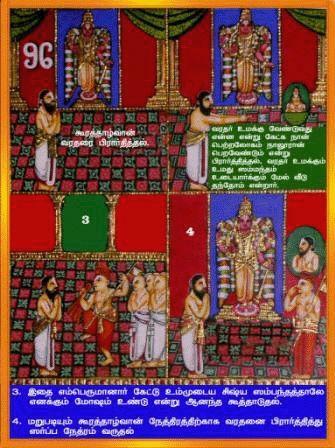 He gets assigned the pourANika kainkaryam in srIrangam temple by emperumAnAr and he also remains the grantha nirvAhi for our sampradayam during his times. He and his wife receives the prasAdham from Sri Ranganathan and from that prasAdham two beautiful children were born to them. They were named parAsara bhattar and vEdha Vyasa bhattar. He is so immersed in arulicheyal anubhavam (4000 divya prabhandham) that whenever he starts saying an upanyasam either he keeps crying after being overwhelmed by anubhavam or he faints. periya perumAL converses with him directly. Finally, he requests mOksham from periya perumAL and periya perumAL grants it. When emperumAnAr asks "how can you leave before me? ", he says "According to sUzh visumbaNi mugil… padhigam in ThiruvAimozhi, when one goes to paramapadam, nityas and muktas come and wash the feet of the newly arriving mukta atma. How can I allow you to come and do that for me? That is why I am leaving before you.". rAmAnujasya charanow sharanam prapadyE !". "The Holy Feet of My Master, Swami Ramanuja, are my sole refuge! For He is an Ocean of Mercy! And for Him all else is dross other than the supreme wealth that is the Feet of God!" Kuresan passed away peacefully after a few hours in the presence of his loving family, Andaalamma and their two young sons Vyasa and Parasara Bhattar. All of Srirangam gathered and performed all the due obsequies and honours that one so great a soul as Kuresan richly deserved. 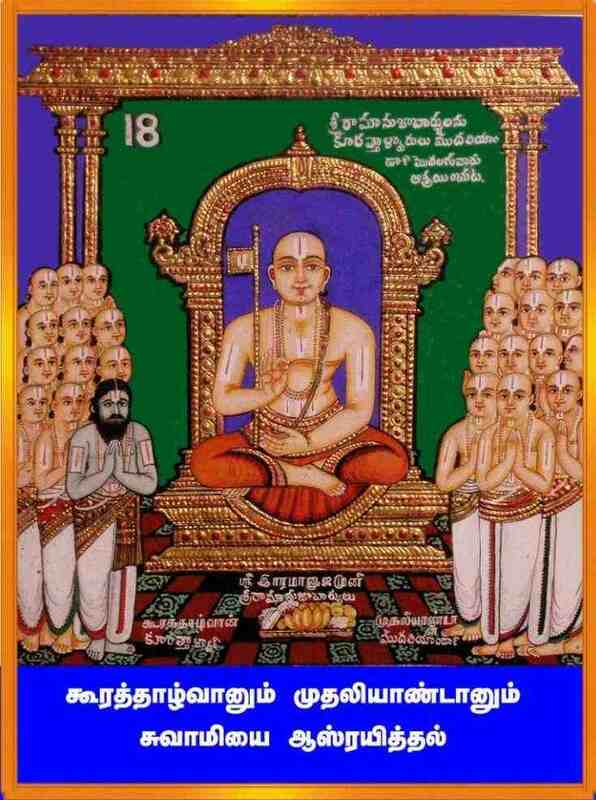 Sri Koorathazhwaan ascended to Sri Vaikuntam which is believed to be by the year 1132, 6 months before Sri Mudaliandan attained Vaikuntam, in service of Lord Ranganatha & Swami Ramanuja. With his head on Pillai azhwaan's lap, lotus feet on Andal's lap (Azhwan's wife) and hand on Parasara Bhattar's lap, thinking about Swami Ramanuja's lotus feet, azhwaan attained Sri Vaikuntam. Swami Ramanuja has so many Sishyas but not one like Sri Koorathazhwaan.